I don’t know about you, but this summer has been an odd one for our vegetable garden. It’s the first of November and we still have peppers and tomatoes ripening on the vine! Things have taken a bit longer to do their thing here in the Midwest and i has left our garden beds lingering on for many weeks past what we thought they would in our little backyard. This warm weather we’re having is a blessing though, as I am not quite ready for thirty degree temps and waking to frost. I am all for that kind of weather for Christmas, but not just yet. Today after laying Alfie down for his morning nap after the boys painted leaves for craft time, I set Theo up in the living room with a new basket of animals toys and a train track to play with. They are on opposite schedules for napping right now, unless of course the stars align like they do about once every two weeks or so, and they happen to fall asleep around the same time. But that was not today. This opposite napping schedule can be hard on me because it feels like we are alway stuck at home, but I have found ways to make use of our time here while one of them is asleep, usually crafting or making something in the kitchen. After prepping the crock pot with this chicken mole recipe (thanks, Martha!) 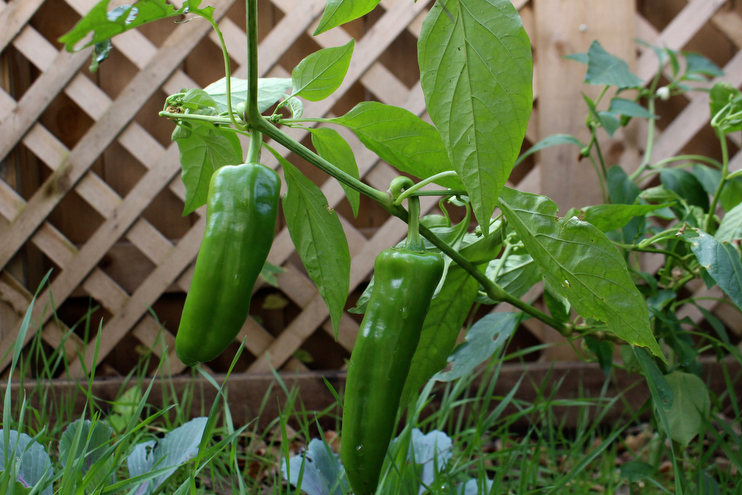 I headed out into the garden to gather a few more peppers to top our tacos with for tonight’s supper. I found about a dozen unripened green tomatoes and a variety of mature chilis on the vine so I grabbed them and decided to make a hodgepodge salsa to go alongside beans and rice. I have had seven green heirlooms ripening in our window sill for about two weeks now and my friend Lindsay brought over a few last night, enough to finally make a fresh salsa to both eat now and freeze for later. We always seems to have salsa ingredients on hand and so making this batch only took about ten minutes from start to finish. It’s a blend between gorgeous purple, red, pink, and green heirlooms tomatoes and three different types of peppers we have out back. 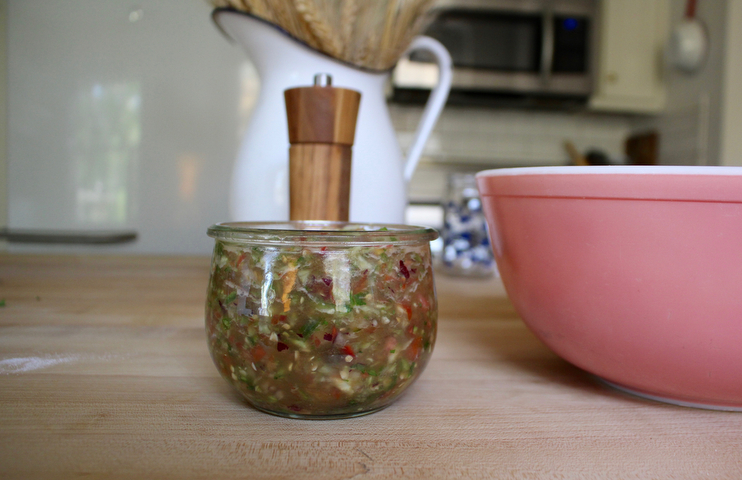 I think if you use what you have on hand in your garden or from the farmer’s market but stick to the same amount of what this recipe calls for each ingredient, you’ll be able to make a very similar tasting salsa to what I’ve got here. The only real issue is with the peppers given that they all very with regard to their level of heat. Refer to the pepper scale below to help you if you need it. 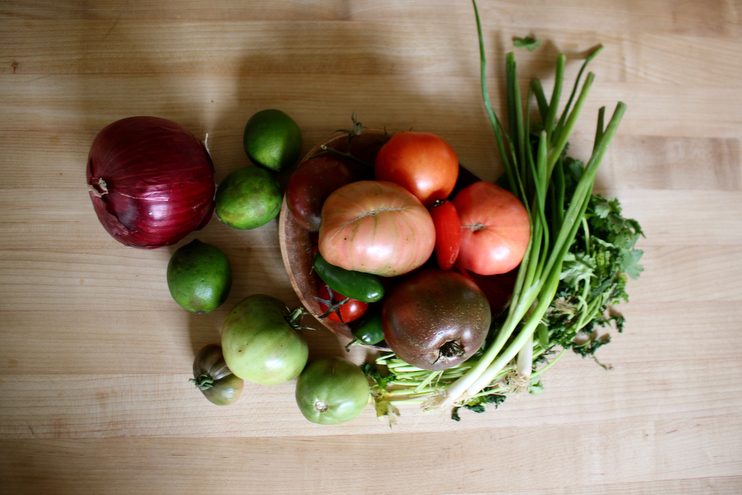 Here’s my simple recipe for garden fresh salsa using up those silly green maters that won’t ripen for you! To prepare, cube your tomatoes with a knife and pulse the, in the food processor until they reach your desired consistency. We like our salsa smack in between runny and chunky, so I pulse quite a bit without blending it into a smooth liquid. My food processor is wonderful for this but you could easily chop them if you don’t have one on hand. After your tomatoes are pulsed or chopped, put them in a bowl and finely pulse/chop the remaining ingredients. You will want the peppers, onions, and cilantro to be very small so you don’t end up getting an overwhelmingly spicy bite. I would even suggest keeping a few hot peppers out if you are serving this to little ones. Our kids like spice, but I always makes sure to chop these hot ingredients very small so they don’t end up with a mouth full of only spicy ingredients or large pieces of onion by accident. Stir all the ingredients in a large bowl and scoop into small weck jars. I love using weck because they prevent freezer burn and make it easy to quickly thaw sauces and other ingredients when needed. They they make for the perfect little container to dip from as well. This batch made about three weck jars full, two of which I froze and then one we are going to have with supper tonight. You really can’t go wrong with fresh salsa you guys. Like my homemade ranch dressing, everything always tastes so much better when made from scratch and it doesn’t have to be complicated just because it’s not store bought. You could always preserve and can your leftovers, but I have found that freezing is a good option too if you have the space and are short on time. Another idea I have is to use this salsa in the slow cooker with a whole bone-in chicken if making tacos. Add the jar of salsa with some cumin, chili powder and a few cloves of garlic and supper will be ready in 6-8 hours! Just de-bone and shred and you’ve home delicious tacos or chicken meat for enchiladas. I do this all the time and the kids love it. And for the curious, here is the pepper scale I use when wanting to find out just how hot our peppers are in comparison to each other. Often times I’ll plant one from the mild, medium, and hot range for our garden and then preserve those by freezing throughout the summer, labeling them as I go so I don’t loose track of the heat level. I hope you use this recipe to inspire some late gardening fun in the kitchen! I never thought to use heirloom tomatoes for salsa before, but what a great idea!